Let's Be Mermaids Fill-In the Blank Invitation Set INCLUDES 12 mermaid party invitations and 12 premium white envelopes. 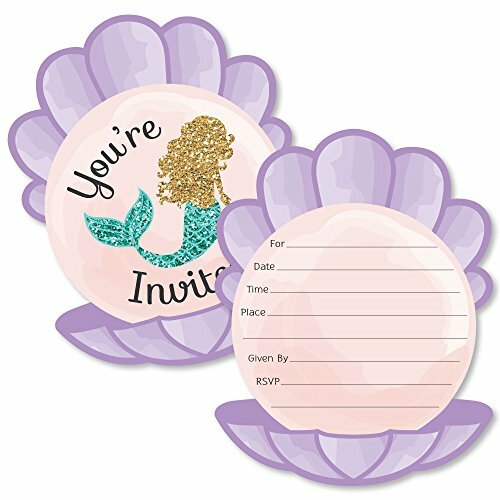 Let's Be Mermaids fill-in invitation are perfect for any event. The little girl mermaid theme is great for a baby shower or birthday party. Mermaid party invitations SIZE 5 inches by 6.75 inches. The included envelopes measure 5 inches by 7 inches. PREMIUM PARTY INVITATIONS: Under the sea party invitation are professionally printed on heavy-duty card stock paper with a photo-like shine. They are individually inspected, then carefully packaged with our exclusive squiggle flap envelopes, making this Let's Be Mermaids stationary set a must-have for any baby shower or birthday party. MADE IN THE USA: Let's Be Mermaids - Baby Shower or Birthday Party Invitations are designed and manufactured at our Wisconsin facility using materials that are Made in the USA. Let's Be Mermaids Fill-In Invitations use a No-Mess Glitter Print: Our invitations are designed with a printed image of glitter, eliminating glitter flake while maximizing bling effect!